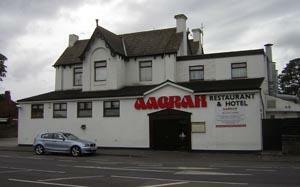 Aagrah Restaurant01924 242222work Restaurant - IndianEnjoy a wide selection of Kashmiri Cuisine from our Mega Buffet. An excellent 3 course buffet meal for only £11.95 per person! Children eat for half price. The Mega Buffet is available every Sunday and Monday evening from 6:30pm to 9:30pm. The normal menu is also available. Price includes starter, main course and dessert. Please contact the branch to check availability of this offer before coming to the restaurant. Enjoy a wide selection of Kashmiri Cuisine from our Mega Buffet. An excellent 3 course buffet meal for only £11.95 per person! Children eat for half price. The Mega Buffet is available every Sunday and Monday evening from 6:30pm to 9:30pm. The normal menu is also available. Price includes starter, main course and dessert. Please contact the branch to check availability of this offer before coming to the restaurant. From M1, junction 39. Follow signs to Wakefield, at next roundabout follow sign to Sandal, across roundabout at Asda turn left at lights on to the A61, continue for two miles.